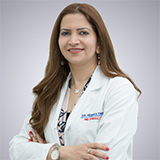 Dr. Monikaa is a Reproductive Endocrinologist and Fertility Consultant at Fakih IVF, Abu Dhabi, UAE practising the subspecialty for more than 20 years. She acquired her MD in 1998, was awarded the membership of the Royal College of Obstetricians and Gynaecologists (MRCOG) in 2004 and FRCOG (UK) in 2016. She was awarded the Fellowship in Reproductive Medicine at the Guy's and St. Thomas Hospital in London which is also the pioneer centre for Pre-Implantation Diagnosis (PGD) in the UK. She attained her Masters in Human embryology from IVI, Valencia, and Spain. She also received her postgraduate award in Reproductive medicine from the Warwick University, UK. In March 2018, she was awarded the "Distinguished physician award in the UAE" by HE Humaid Al Qatmi, Chairman, Dubai Health Authority. She is the co-author of the textbook "The Art and Science of Reproductive Medicine", published by Jaypee brothers in 2017. She has the privilege to be on the editorial board of the Global Reproductive health, the official journal of the International Federation of Fertility Societies. She is the course director and the faculty of the Postgraduate course in reproductive medicine, an academic programme since 2016 which is the first of its kind in the UAE in affiliation with the Schleswig Holstein University, Germany. Her research work has been published in many international and National journals and presented papers on controversial subjects in reproductive medicine at the ASRM and ESHRE conferences. Her recent full research paper on “morphokinetic analysis of embryos and pre-implantation genetic diagnosis“ was published in the Journal of Assisted Reproduction and Genetics in 2016. She is a member of the American Society of Reproductive Medicine, the British Fertility Society and the American Association of Gynaecology Laparoscopists. She has extensive clinical experience after practising in India, UK and now in the UAE for over a decade. She believes in holistic infertility care and also provides minimal access treatment for the same. She has pioneered the evolving health and fertility awareness and disease management trends in the MENA region for a substantial time period. She has contributed to the birth of many healthy babies in couples with rare morbid diseases due to consanguineous marriages. She was instrumental in the birth of the first BRCA gene free baby in the UAE through pre-implantation genetic testing.